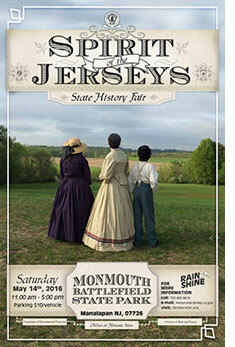 (16/35) TRENTON – New Jersey’s rich and diverse historic heritage will be celebrated this Saturday, May 14, during the 12th Annual Spirit of the Jerseys State History Fair at Monmouth Battlefield State Park in Manalapan Township, Monmouth County. More than 140 historical, governmental and nonprofit entities and organizations will be participating in this year's fair, sponsored by the DEP’s Division of Parks and Forestry in partnership with numerous supporters. “We encourage all who love history, want to learn more about our past, or simply want to have a good time to come to the fair, which promises to offer something for everyone – from military history buffs and sports lovers, to those who simply like to sample unique food,” said Parks and Forestry Director Mark Texel. Many of the groups represented work to preserve important New Jersey historic sites, such as Batsto Village in Wharton State Forest, Fort Mott in Salem County, the Village at Allaire in Allaire State Park, Princeton Battlefield, and Morristown National Historical Park. Exhibitors and re-enactors are coming from across the state as well as from Maryland, Connecticut, Delaware, Pennsylvania and New York. As the site of one of the most pivotal battles of the American Revolution, Monmouth Battlefield, with its rolling farmland and hedgerows, makes a fitting backdrop for the fair. At the fair, visitors can step back in time and participate in military drills, watch as horse-drawn plows dig furrows, experience baseball as it was played in the 19th century, marvel at a “flying flea circus,” admire vintage automobiles, keep time to live Civil War-era music, and experience a U.S. Army radio show spanning World War II to the Vietnam War era. Other highlights and new to this year’s fair is an exhibit featuring a replica of President Abraham Lincoln’s casket with the 14th New Jersey Volunteers Regiment, a Civil War re-enactor group, serving as honor guard. A series of historical presentations on such Civil War era topics as music, literature, and soldiers’ accounts of their service, will round out this aspect of the fair. 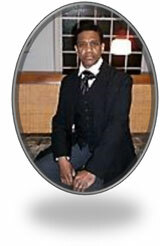 Historical characters portrayed at the fair will include Civil War Admiral David Glasgow Farragut; abolitionist Harriet Tubman; founding father Ben Franklin; James Still, known as the “Black Doctor of the Pines;” Emily Warren Roebling, who saw out the completion of the Brooklyn Bridge after her husband, Washington Roebling, became very ill; vaudevillian actress Mabel Fenton; American Red Cross founder Clara Barton; Battle of Monmouth heroine Molly Pitcher; Continental Army General George Washington; and Walt Whitman, the celebrated 19th century poet who spent the last years of his life in Camden. In the late 17th century, New Jersey was comprised of two distinct provinces – East Jersey and West Jersey. The Spirit of the Jerseys State History Fair, takes its name from this fact, and was first held in 2004 to celebrate the centennial of New Jersey's state-owned historic sites – a system that began in 1903 with the state’s purchase of the Indian King Tavern, the Haddonfield landmark where New Jersey completed its transition from colony to statehood. Activities at the State History Fair can help fulfill badge requirements for Cub Scouts, Boy Scouts, Brownies and Junior Girl Scouts. In addition, teachers who participate in activities during the fair are eligible for professional development credits. Vendors will have a variety of food available that will showcase New Jersey's diversity, including sushi burritos, empanadas, lobster rolls, crepes, Italian ice, cheesesteaks, and chicken pita gyros.